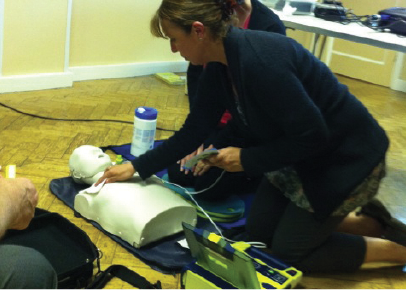 A portable life saving resuscitation machine will give heart attack victims in Lindfield a better chance of survival. The machine, an Automated External Defibrillator which delivers a shock to the heart, will be located outside Selby’s Pharmacy in the High Street and can be borrowed by residents faced with an emergency. It’s been funded by Masters and Son, whose staff were amongst the first to be trained to use the machine. Although the machine can be used by anyone, training is available free of charge to villagers. Run by Douglas Coombs, Director of Training at the Sussex Heart Charity, the course teaches people to recognise the symptoms of heart failure, carry out chest compressions and use the machine to deliver a shock to the chest to restore the normal heart beat. “It is vital to start chest compressions immediately as every second counts,” said Douglas who spent 25 years as a paramedic. “For every minute there is no compression the chances of success go down by 20%. There is no substitute for good effective chest compressions.” He added that calling an ambulance should also be the priority. The machines are incredibly simple to operate and users are guided through the steps by a recorded message – rather like a Sat Nav. Machines have also been installed at Gatwick Airport and many other locations in Sussex. Villagers who have been trained to use the machine include Will Blunden and Christine Irwin from the Parish Council, Tracey Osgerby, Ian Masters and Craig Radmall from Masters and Son and Liz Thomas and Nicola Whatford-West from Glyn Thomas & Son the butchers.